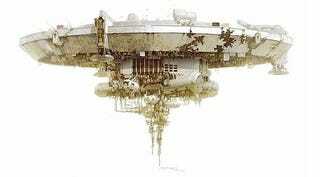 It may be a broken-down space wreck housing a mess of aliens rolling about in their own filth, but District 9's mothership sure is a beauty. This newly-released concept art from Greg Broadmore shows the ship in full, trashed glory. We've talked to Broadmore about space weaponry before, specifically his love of ray guns. But you can check in on the man who helped craft Neill Blomkamp's alien power suit over at his blog.